This guidance will help you (the tenant) make an online Land and Buildings Transaction Tax (LBTT) lease review return. Separate guidance is available on ‘How to pay LBTT’, including BACS/CHAPS payment arrangements. It is the tenant’s responsibility to ensure the LBTT return is complete and accurate. If you are unsure about any matter relating to the LBTT return you should seek professional advice. Note: If there are two or more tenants, you must complete a paper LBTT return. The paper LBTT lease review return can be downloaded from the ‘Submit a return’ section of our website. The LBTT lease review return for tenants can be accessed via the ‘Submit a lease review return’ page on the Revenue Scotland website. This return should only be used by tenants. Agents submitting lease review returns on behalf of tenants should use the SETS online portal. Once you have requested access to the return, you must complete it within 90 minutes. You cannot save a draft or amend the return so it is important to ensure that you have all the key information, as listed above, to hand before you access the return. Information on how to amend an LBTT lease review return can be found towards the end of this guidance. Note: We do not accept amendments to returns over the phone. Enter your email address and full name, then press ‘OK’. You will receive a notification that we have sent you an email with a link to the LBTT lease review return. 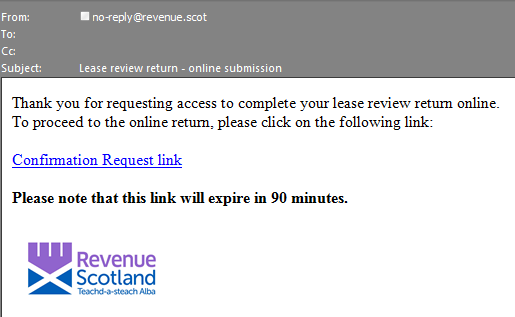 Go to your inbox and open the email from 'no-reply@revenue.scot' with the subject 'Lease review return – online submission’. You may need to check your spam folder if the email does not appear in your inbox. Click on ‘Confirmation Request link’ to access the LBTT lease review return. You have 90 minutes from the email being sent to access and complete the return. Is this return for a Three-yearly review, Assignation or Termination? Questions for the ‘Incorporated Bodies’ sub-section. Note: For these purposes Private Individuals and Representatives includes partnerships, and Incorporated Bodies includes unincorporated associations, charities and unit trusts. The option you choose will automatically update the return to only display the set of questions relevant to that option. Where there is more than one tenant, you must answer this question each time you use the ‘Add’ option, and you can include a mixture of both ‘Private Individuals and Representatives’ and ‘Incorporated Bodies’ Tenants. Answer this question if the tenant is an individual. Give the correct NINO for the tenant – we will not accept a temporary NINO. If the tenant does not have a NINO then answer the question below. Enter the current address of the tenant, including the house (or office) name and number and postcode. You must also enter the name of the country to which the address relates. This is the address we will use if we need to correspond with the tenant involved in this transaction. You must answer either this question or the preceding ‘Company Number’ question (note: if you are claiming charities relief you must answer this question). Only one of these questions can be answered - if you answer the latter, this question will be greyed out. Enter the charity number if the tenant is a registered charity. Enter the current address, including the house (or office) name and number and postcode. You must also enter the name of the country to which the address relates. This is the address we will use if we need to correspond with the tenant(s) involved in this transaction. The section will only be enabled if you have a have selected ‘Assignation’ on the ‘About the Transaction’ section of the return. The actual amount of rent payable for each year in the remaining term.If the amount of rent to be paid varies in accordance with the provisions of the lease (for example, where there are rent reviews or in turnover leases), then a reasonable estimate should be provided (see LBTT6005). Assistance with the calculation can be found by selecting ‘Calculate’ in the ‘Calculate tax payable’ box which will display the total tax payable based on the information you have entered elsewhere in the LBTT return. Please note however that because LBTT is a self-assessed tax the tenant is ultimately responsible for the amount entered against this question. While we have provided the ‘calculate tax payable’ function for your assistance, we take no responsibility for your use of it in answering this question. Please check that the bank details are correct. Once you are satisfied that all the details are correct you can submit the return. We aim to deal with all repayment claims for which we have full information within 10 working days of receiving them. We will contact you if we need further information to enable us to make the repayment. When you have completed the LBTT lease review return and are ready to submit it, select ‘Submit’ on the far right side of the ‘Declaration’ page. If you select ‘Submit’ and an error dialogue box appears, you must correct any relevant errors before you can successfully submit the return. An email will be sent to you to confirm your return has been submitted and provide you with your unique transaction reference. You can save a copy of the LBTT lease review return by clicking ‘Download PDF’. You will not be able to access your return online after this point. A dialogue box will appear on screen asking you whether you wish to open or save the PDF file that has been created. Choosing ‘Save’ will allow you to save a local PDF copy of the tax return. By either choosing the ‘Open’ option, or opening the PDF file later on after saving it, you will be able to print off a hard copy of the LBTT return – this may be of particular benefit when completing your next LBTT lease review return. You can amend an LBTT lease review return by writing to us at the address shown further below (quoting the return reference number) and telling us, for each field you wish to amend, the current entry and the entry you wish to amend to. No amendment is possible more than 12 months after the filing date of the return. We will reject any requests for amendments received after the expiry of this 12 month amendment period. The ‘filing date’, as defined in section 82 of The Revenue Scotland and Tax Powers Act 2014, is ‘the date by which that return requires to be made by or under any enactment’ – in other words it is the last day on which the return can be made to us before it is late. In a three year review return, the filing date is 30 days after the three year anniversary date of the transaction. If more tax is payable as a result of the amendments you have made, then the normal payment rules and arrangements apply (that is, you must enclose a cheque for the additional amount payable) – see the separate guidance on ‘How to pay LBTT’. You will also have to separately pay interest on the additional amount of tax payable, charged from the filing date of the return until the date the additional amount is paid. Note: do not include the interest in any request to amend the ‘Amount due for this return’ question in the ‘About the Calculation’ section of the LBTT return. Interest is administered separately by us and we will send you an Interest Notice if interest is due. If less tax is payable, we will repay the excess amount to you with interest (see the separate guidance on interest on repayments provided at RSTP4004). If the amended return contains an inaccuracy then the person on whose behalf the amended return is being made may be liable to a penalty – see RSTP3011.